Lok Sabha polls: Will it be Pragya Thakur vs Digvijaya Singh in Bhopal? Rs 68 lakh worth of gold from Ariyalur, about 260 km from Chennai. The EC revealed its flying squad and surveillance teams had recovered about Rs 14 crore in cash till last weekend. 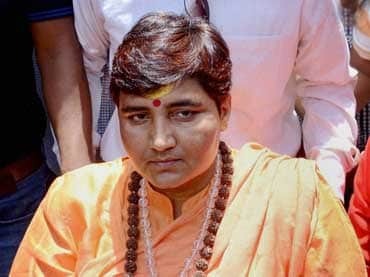 Will Pragya Singh Thakur (pictured) get her wish? The self-styled godwoman and Malegaon blast accused has been doing the rounds of the Bharatiya Janata Party (BJP) offices, demanding that she be fielded against former chief minister Digvijaya Singh from Bhopal in the coming Lok Sabha election. After MP Chief Minister Kamal Nath announced that Singh would contest from the city, Pragya expressed her desire to contest, saying, “I want to fight against Digvijaya in this contest of justice and injustice.” Bhopal is a seat the Congress has not won in the last three decades. The grand alliance of political parties in Bihar has given VIP entry to a little-known outfit. The Rashtriya Janata Dal (RJD) gave three Lok Sabha seats to the Vikassheel Insan Party (VIP), formed barely a year ago. The “VIP” hasn’t fought a single election but has tremendous influence among the Nishad community members. In total, the RJD has conceded 11 seats to the backward and mahadalit parties in the alliance. This alliance is an umbrella social coalition for 40 Lok Sabha seats in the state stitched up to restrict the National Democratic Alliance’s efforts to woo floating voters among the intermediate castes.